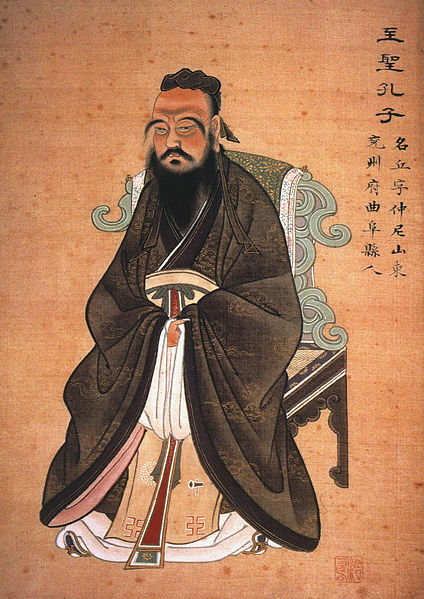 Painting of Confucius, circa 1770. The Granger Collection, New York. I recently read something by a somewhat prominent writer on the martial arts that made me sit up and take notice. The author (who remains nameless as I am about to criticize him) noted that a large number of traditional martial arts have a close association with a spiritual tradition (Buddhism, Daoism, Shinto etc.) and that those which do not are missing something essential because they provide no ethical framework to regulate the exercise of the deadly skills that they pass on. This comment was more of an aside than anything else and the author proceeded on with his main point without explaining his observation or offering any suggestion to those poor benighted martial artists (all of whom presumably occupy American MMA gyms) who aren’t getting regular spiritual edification. I am not even going to count the number of problems I have with this author’s stated and unstated assumptions. The statement appeared in a venue known for its “high quality” publications, yet it really is one of the most problematic things that I have read all week. And given how much time I spend reading oral accounts of martial arts history, that is really saying something. Yet as I considered the question I realized that perhaps this sentiment is much more widespread than we suspect, even in the world of Chinese martial studies. In fact, I suspect that it plays a major role in the ongoing “orientalism” of the martial arts. Even in an art as seemingly agnostic as Wing Chun we see this tendency repeatedly rising to the surface. So is it true? Does Wing Chun need a spiritual center? Is some system of religious teaching necessary to instill “good ethics” in martial artists? Should Wing Chun even be concerned with “ethics”? How do we know an action is “ethically good” to begin with? From what perspective? My professional background in political theory leads me to suspect that the answers to these puzzles are probably a lot less obvious than they might appear. Importing a religious world view would certainly provide anyone wishing to build a system of martial ethics with a firm foundation to start from. But is this what we should be doing in the first place? If I were to reconstruct Wing Chun around some new ethical core which constrained the potential actions of my students, would it still be Ip Man’s Wing Chun? 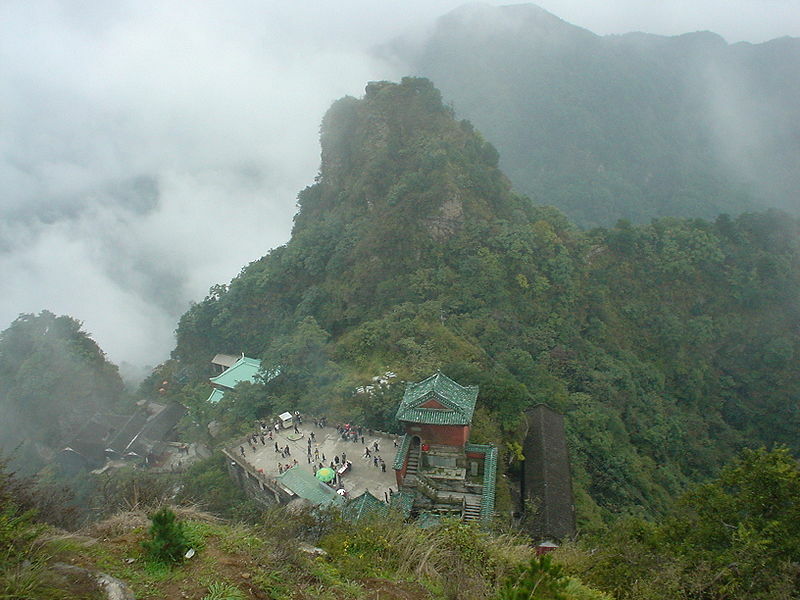 Wudangshan, a sacred mountain long associated with the “internal” martial arts. For the most part “orthodox” Wing Chun schools in the Ip Man tradition don’t deal all that explicitly with religion or spirituality. The Wing Chun creation story mentions the Shaolin Temple, but so does every other martial art practiced by the Cantonese speaking minority of southern China in the 20th century. There is no evidence that Ip Man, Chan Wah Shun or Leung Jan were devoted Buddhists. While a few non-Ip Man lineages have tried to make Buddhism central to their identity, this trend has never caught on with even a substantial minority of Wing Chun practitioners. To the extent that Buddhist stories or ideas are discussed they seemed to be used as metaphor to illuminate some aspect of physical practice rather than as an actual Dharma to structure spiritual devotion. Much the same can be said for Daoism. Of course in Hong Kong and Taiwan Daoism, as a folk religion, is deeply tied to the world of “rivers and lakes” and has a certain amount of overlap with martial arts schools. Occasionally local temples sponsor demonstration troops who perform on festival days. But this is not what anyone in America thinks of when they hear “Daoism.” In the west we give a lot of priority to the ancient Daoist philosophical tradition. This strain of Daoist thought is probably most common in the “internal” arts of northern China. In my experience it is not really seen all that much in most southern schools of Kung Fu. It did have an important impact on individuals like Sun Tzu and General Qi Jiguang, and so its basic insights filtered into the modern martial arts through the classic works written by these earlier strategists. Yet when I see Daoism being referenced it is generally as a metaphor to help explain modern practice (e.g., how the footwork in Pak Mei corresponds to the ‘five elements’) rather than as a subject for life-long dedicated study. In some ways I think that this is a southern vs. northern thing. I am about to do the most dangerous thing you can imagine when writing about Chinese martial arts. I am going to make a sweeping generalization. I know there are some obvious exceptions here, but just follow me for a moment. Northern arts seem more likely to attempt to offer a complete system of theory and practice that can structure most elements of a practitioner’s personal life, if they so wish. Xingyiquan has a fascinating theoretical basis, Taijiquan actually has a corpus of ‘classics’ and as near as I can tell it is impossible to Master Shaolin kung fu if you start after 8 years of age and don’t go to a dedicated boarding school. To be really authentic the boarding school also needs to have dodgy plumbing and limited heating in the winter. Judged by this standard the boxing systems of Guangdong might look unimpressive. That is certainly what R. W. Smith concluded. He was wrong. For all of his experience he never seemed to grasp that arts like White Crane, Pak Mei or Wing Chun have fundamentally different goals and different strategies for achieving them. Rather than being the sprawling life-ways that he was exposed to in Taiwan, these arts are small and compact. They are simple by design. In the southern martial arts beauty often presents itself as an exercise in parsimony. The southern arts are like the game of golf; one bag, a box of balls and no more than 14 clubs. Your job is to put the ball in the hole. It is all so simple. But the joy of golf comes from a lifetime of practice and refinement. Likewise, with the southern martial arts your job is to hit the guy. Just hit him. Don’t drop-kick him off a moving horse. Don’t spend the first two years of training “cultivating your qi.” Just punch him as hard as you can. The sophistication of these arts comes from doing simple things really well. It rarely looks impressive, but it takes years of practice. While Taiji has a corpus of ‘classics’ and the internal arts have benefited from the erudition of students like Sun Lutang, I am not sure that its really necessary to import a complex philosophical system into something like Wing Chun. At best you would make it more like the northern “internal” arts, but that misunderstands its basic nature on a fundamental level. Importing such a system might distract from the essential beauty of the art. The southern fighting systems are beautiful, multifaceted arts small enough to fit into a jewelry box. And the great thing about that is they can also fit into one’s life without taking it over. It makes them very compatible with the modern world, but this idea was also there from the very beginning. 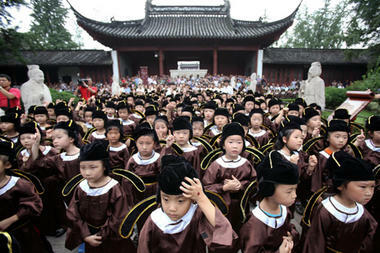 Children in China dressed as Confucian scholars to celebrate the first day of school. This article provides another perspective on the resurgence of Confucian values in Chinese society. Photo Credit: Christian Science Monitor, September 2 2011. For all of the reasons above (and others that I have discussed here), I am ambivalent about the place of Daoism and Buddhism in modern Wing Chun. I suspect that almost all of the “religious” elements of the art that people often point to can actually be better explained through a basic understanding of Chinese culture. To the extent that religious discussions increase our background understanding of Chinese culture they may be a good thing. Beyond that some caution is needed. Of course one of the complicating factors here is that the baseline level of engagement between Chinese society and religion is rapidly changing. As the newly empowered and enriched workers of China look for things to spend their earnings on, and seek to create more of a sense of meaning in their personal lives, religion has become an increasingly important force in Chinese society over the last 30 years. One of the most interesting phenomenon that one sees within this general field is the increased popularity of Confucianism. Confucius, a sixth century BCE philosopher and thinker (more commonly referred to as “Kongzi” in Chinese) created a school of thought that had a profound impact on the development of Chinese society. However, his legacy has also generated controversy. In certain critical ways philosophical Daoism was a direct response to the perceived overreach and hubris of the Confucian state. More recently Mao noted that Confucius created a highly stratified and hierarchic society (in which sons were always subservient to fathers, wives to husbands, peasants to gentry, subjects to the state) that led directly to economic inequality and structural abuses of the lower levels of society. In fact, modern Chinese Communism spent most of its career routing out and destroying the last vestiges of Confucian thought and behavior in Chinese society. Recently this hardline stance has been softened. The liberalization of China’s economy has created many positive changes in people’s lives. Yet there is a wide spread perception that something is lacking in this new capitalist order. It is often said that individuals in China have developed an unhealthy obsession with money. Further, this is all happening in the moral vacuum left by the retreat of the Communist state and its Marxist ideology. There do seem to be some worrying trends in modern Chinese society. Empathy and the generalized level of “social trust” are reaching an all-time low. This trend has been noted by public intellectuals, party cadre and micro-bloggers all over Chinese society. It is also one of the things that maybe driving the resurgence of interest in Confucius and his ethical legacy. Bringing Confucius back into the public discussion could be a master stroke that solves many problems at once. He is a uniquely Chinese figure who points back to the glory days of the imperial past, when China was seen as the dominant figure in Asia, on both a military and moral level. His teachings could certainly be turned into a new civic order without too much effort. Further, by promoting an indigenous Chinese figure the government also hopes to undercut the appeal of “foreign” religion, such as Christianity and the house-church movement. Of course the delicate issue for the government is how to do this without appearing embarrassingly hypocritical and self-serving. 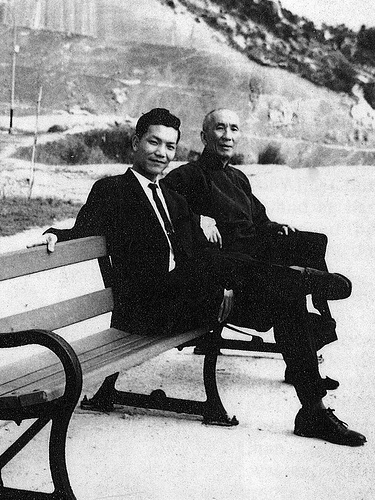 Ip Man and his oldest son, Ip Chun, sitting in Hong Kong during the 1960s. Confucianism: Wing Chun’s Missing Core? Given this basic social background, it should not be surprising to learn that a number of individuals are asking some rather serious questions about Wing Chun’s relationship with Confucian values. At first it seems absurd that any martial movement would want to align itself too closely with Confucian thought given the general hostility of this philosophy towards the “martial virtues.” However, if you dig a little deeper, there is an argument to be made. Ip Chun, the oldest son of Ip Man, is probably the most vocal supporter of Confucian values in the Wing Chun world today. He points out that his father was, in essence, a Confucian gentleman with a dual Confucian and western education. He was never a Buddhist (though he was certainly conversant with its core ideas) and the most Daoist thing about his life was probably his burial. However, as Chu Shong Tin and others have testified, his early students remember him as the living embodiment of Confucian values. That, and his sense of humor, come up over and over in accounts of the “early days.” It is clear that these social habits helped to attract an entire generation of young students who were trying to work out exactly what “Chinese” identity should look like in Hong Kong during the 1950s and 1960s. There are other, less historical, reasons why Confucianism might play an important role in Wing Chun’s future, at least in mainland China and Hong Kong. In the west martial arts are a popular, if somewhat exotic, pastime. They don’t really convey much social meaning to the average person, let alone a negative or hostile one. The same cannot be said of China where most people still mistrust the martial arts because of their long association with youth delinquency and crime. Even at the best of times the martial arts have a distinctly “working class” vibe at a time when China as a whole has developed “middle class” aspirations. Enrollments in all sorts of martial arts in China have been falling and there is a perceived need to address these perceptions. One of the obvious openings that modern martial artists seeking to demonstrate their relevance can exploit is the general love of health practices and “self-cultivation” in China. Now that Qigong has come under official state control it’s a less dynamic area than it once was. Nevertheless, the Chinese public is a big believer in the link between low impact exercise and health. This is certainly something that Wing Chun could promote. Still, it is not clear that the martial arts have any unique advantages in that area. This is where the ideology of “self-cultivation” becomes critical. “Eating bitter” to improve oneself has a long history in martial practice and that is respected by Chinese society as a whole. It is also the aspect of “martial virtue” that is the easiest to square with traditional Confucian ethics. Further, the concentration and focus that certain martial exercises, such as Chi Sao, promote are similar to the mindfulness and meditation ideas promoted in some neo-Confucian schools. Ip Chun has discussed this and argued that Chi Sao should be augmented explicitly with this sort of mindfulness training. Further, Wing Chun students should, in his view, study the Confucian “Doctrine of the Mean” as well as traditional Chinese ethics. These suggestions have been accepted by a number of Wing Chun students in the west seeking to better understand the roots of their practice. This is an interesting move on his part. Rather than revealing something about Wing Chun’s past (where there is no evidence of formal philosophical training) what he is really doing is attempting to ensure the arts future. By playing down its association with violence, emphasizing Chi Sao as a “self-cultivation” practice and riding the coat-tails of the rising popularity of Confucianism, Ip Chun appears to be trying to open a social space where middle class, educated, Chinese individuals will be willing to take up the art. It is critical to realize that Ip Chun is doing all of this to address issues and problems that are much more common in China than America. The martial arts are not scorned in the west and Wing Chun’s growth has been quite healthy. Further, the genius of Confucianism is that it points out how you can integrate different groups into a hierarchic model of society. That may be critical in modern China, but it is very different from the social model that most of us in the west would be comfortable with. We have actually been quite busy trying to integrate Wing Chun into a horizontal and democratically organized society. So yes, there is a movement towards building a “spiritual center” for Wing Chun in both the west and China, but I am not convinced that they are responding to the same problems. I think in the west this is a symptom of some pretty “orientalist” assumptions about what a proper martial art is “supposed” to be. Traditionally most martial systems had very little ethical content, and anyone who tells you otherwise is either mistaken or trying to sell you something. In China the move towards Confucianism is broad-based and seen in all sorts of areas outside the martial arts. Ip Chun’s adoption of this movement is meant to change the social profile of the art, not educate his students as to when it is OK to hit an attacker. Conclusion: Personal Choice and Spirituality in Wing Chun. In the words of the inestimable Yogi Berra, the problem with not knowing where you are going in that you just might get there. Anyone should be able to find a degree of deep personal satisfaction in a practice like Wing Chun and that is a good thing. If you personally feel called to be a Buddhist, then by all means go and do it. That is also a good thing. However, it is not the case that one needs to be a Buddhist or a Daoist to understand Wing Chun. Orthodox Buddhism has very little to say on the topic of serious self-defense. Ip Chun’s turn towards Confucian thought is much more interesting to me. I hope that it will help me to understand Ip Man better, and give me a fuller sense of what is going on in Chinese society today. But I don’t really expect that it will give me ethical guidelines for the use of deadly force, because that’s not really the problem that Ip Chun is addressing. In the final analysis Wing Chun no more needs a spiritual center than does an auto mechanic or a computer programmer. It would certainly be possible to adopt a religious frame of reference (Zen and the Art of Motorcycle Maintenance anyone?) but it is not necessary to do so. The critical thing is probably to be clear about what your goals actually are at the outset. I enjoyed this essay very much. And it makes an important point that is often overlooked in western discussions of Chinese martial arts and that is: all Chinese martial arts were developed in a Confucian setting. I realize there maybe some exceptions to this, for example modern Wu Shu developed in the 1950s and 1960s in the People’s Republic. But then that gets into a major issue of did Maoist era China really wipe out Confucianism or not. Laying that aside it is safe to say Confucianism underlies Chinese martial arts. Great essay! I am glad you liked it. I do think its odd how often martial arts discussions ignore the existence of Confucian culture and practice. If nothing else, its hard to understand the norms of the “Rivers and Lakes” unless you know what they are reacting too. More broadly speaking, knowing how to deal with religion in the Chinese martial arts can be sort of tricky. On the one hand I don’t want to fall into the trap of “orientalism,” but on the other hand I don’t want to divorce the martial arts from traditional Chinese society and culture (where certain sorts of religious practices and beliefs were fairly common) either. I will admit to not having it all figured out yet, but I find writing these posts to be a useful exercise. They help me to explore new topics and try out different positions. You seem to be having trouble understanding my posts and articulating your own responses. This blog is dedicated to the academic study of the martial arts. That means that we approach thing from a social and historical perspective and rely on scholarly resources. Please believe me when I tell you that I am very familiar with what Ip Man said about the history of Wing Chun. But the myth of the southern Shaolin temple is just that. A myth. I am not aware of a single real scholar who accepts its existence. Nor does it explain Wing Chun’s origins. Nor, for that matter, did I say even say that Bodhidharma was a myth. I said that his connection with Kung Fu was fictional, and it is. Most people are not interested in the academic discussion of the martial arts, and that is fine. How practitioners experience the martial arts and how scholars discuss them will never be the same. If you are going to continue to participate here please try and keep your comments on topic or I will start placing them in moderation. Thanks. I am a little confused at what you are getting at here. As I mentioned in the response to the commentator above I (and everyone else here) am well versed in the Wing Chun creation myths. The problem arises when we try to use these fairly recent pieces of folklore to make generalizations about China’s past. While Shaolin did become an important early center of Chan study, that school was probably not invented there. Nor was Ng Moy likely a real person. Buddhism was highly regulated and licensed by the government. The end result is that we know a lot about it in the late imperial period. Its actual history is a lot less mysterious and subject to speculation that people seem to think. Ng Moy does not show up in any extent record. Her name first appears in a Kung Fu novel written in Guangdong in 1893 where she is a traitor who is responsible for burning down the Shaolin Temple. She was not re-imagined as a wise heroine until a set of novels went about redeeming her in the 1930s, at about exactly the same time that Wing Chun was starting to become popular in Foshan. Given that there is no evidence that she is real, or that Wing Chun had anything to do with the actual Shaolin temple, I think that its a mistake to put too much weight on these stories when trying to understand the systems origin or nature. As I mentioned above, Confucianism seems a much more likely place to start.